Socket, extension and ratchet for removing the Oil Pan bolts. Once you have the vehicle raised, check to make sure that it looks like the oil Pan will be able to drop down without obstruction. What you are looking for is parts of the vehicle such as frame or suspension that may prevent this from happening. If you do see something, you may want to Google your vehicle to see if others have encountered issues with removing the Oil Pan or buy a workshop manual on the vehicle. You can't just pull the oil pan backwards, forwards or sideways to remove it as the bottom of the engine crankshaft can prevent this from happening unless the oil pan can be dropped enough not to be held up by the crankshaft. Better to find this issue now than when the Oil Pan is partly removed. If you do find parts of the vehicle in the way, your vehicle may require component removal and or jacking of the engine to lift it out of the way so that the Oil Pan can be removed. 1 - On Level Ground, raise part of car with engine (front or back) securely on ramps or jack stands. Block/chock wheels that are not raised so that they will not move. Make sure emergency brake is on, car is in gear and engine off. Make sure car will NOT roll on top of you while underneath it. A problem that may be encountered is difficulty accessing all bolts in the Oil Pan Flange. Check that you can access all bolts before starting the removal process otherwise you may need a shop or a special tool to do the work for you. 2 - Drain oil out of the Oil Pan into a container via the Drain Plug. This oil should be disposed of as per the regulations for where you live. 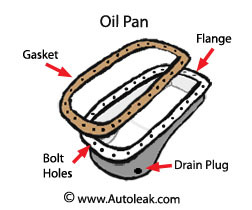 3 - Once oil has finished draining, remove bolts around flange of Oil Pan. Keep track of which bolt hole a bolt came out of as sometimes they can be different lengths. These bolts will need to go back in the same hole they came out of if they are different lengths. You can use a piece of cardboard with holes the same size as the bolts to track the positions. Place the bolts in the holes of the cardboard as you remove them. 4 - As you get to the last few bolts in the Oil Pan Flange you will need to support the Oil Pan so that it does not put to much weight on the last bolts. If you do not do this, you may damage the bolts or the bolt holes which they come out of. 5 - Once all the bolts are removed then the Oil Pan should drop away from the engine. Sometimes it needs a gentle tap. Other times part of the Oil Pan Gasket may stay attached to both the engine and the Oil Pan. Since the gasket is to be replaced it is okay to cut it. 6 - The old Oil Pan Gasket will need to be cleaned/scraped off of the Engine if it did not come off cleanly. A scraper can be used and there is a gasket spray that dissolves gasket but be careful not to get it on yourself. 7- Make sure when cleaning off the old Oil Pan Gasket to remove any bits that get inside the engine as you clean. It should be noted that Oily Rags can catch fire and should be stored in a flameproof container with a lid until disposal. All rags should be disposed of as per the regulations for where you live. 1 - Line the shape of the Oil Pan Gasket up with the shape of the Oil Pan. 2 - A few little drops of High Temp Silicone on the outside edge of the Gasket can be used to keep it in place on the Oil Pan while moving the Oil Pan into location. 3 - Before tightening any Oil Pan bolt, make sure that all bolts are going through the Oil Pan Gasket into the Engine. Quite often the Gasket can shift as the Oil Pan is put in place and is no longer where it needs to be. 4 - After bolts are lightly tightened then do the final part evenly a little bit at a time rather than one bolt fully to avoid warping (bending) the Oil Pan. 5 - Make sure Oil Pan bolts of different lengths are going back in the right Engine Bolt Hole. 6 - Refill the engine with the correct type of new oil and amount of oil before starting. Make sure to have a Drain Plug in the replacement Oil Pan before adding the oil.